Jim Tinjum, an associate professor of engineering at the University of Wisconsin-Madison, on his recent #bikethesun tour. On Jim Tinjum’s #bikethewind tour last year, he often saw the installations he visited for miles in advance — turbines towering gracefully in the distance. On his recent #bikethesun tour, covering 2,000 kilometers of the Upper Midwest, he often had to pedal around in search of his solar destinations. “Some of the sites were nestled in to the landscape pretty well,” said Tinjum, an associate professor of engineering with a specialty in renewable energy at the University of Wisconsin-Madison. The goal of the two journeys was the same: to raise awareness of the ways that renewable energy is and could further provide clean power in the Midwest. 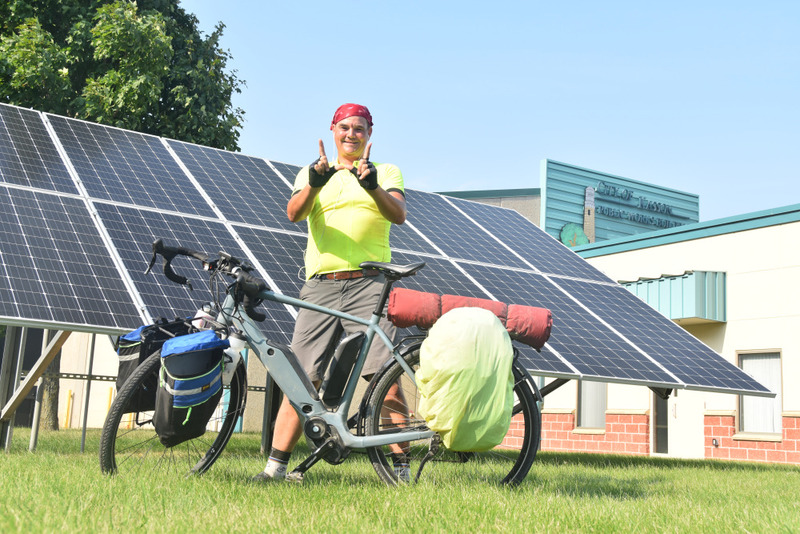 The solar bike trip, which concluded in August, took Tinjum through a plethora of solar gardens in Minnesota, Invenergy’s Grand Ridge Energy Center in Illinois, a Wisconsin solar-powered coffee roaster and countless homes and businesses with rooftop solar. The trip helped generate excitement and awareness of solar energy, he said, in part through local media coverage and social media, where his team estimated one million people have heard about the bike trip. The trip has also given him the chance to talk first-hand with engineers, developers, landowners and contractors around the Midwest about the challenges and benefits of siting and installing solar, insight he plans to share with others in the field. The solar tour had an extra bright spot: Tinjum used it to raise funds for solar on a home for abused children in Puerto Rico, where the island’s energy system was decimated by Hurricane Maria a year ago and has yet to recover. Tinjum’s fiancé and mother-in-law are Puerto Rican, he noted, and he visited the island in May to help restore renewable energy installations damaged by the hurricane. Tinjum is working with the university’s chapter of Engineers without Borders and graduate students in the Sustainable Systems Engineering (SSE) group he advises to install solar for Hogar Albergue para Niños Jesús de Nazaret in Mayaguez, a city on the island’s western coast. The installation will save the nonprofit institution about $500 a month in energy bills, freeing up more funds for the work with children, Tinjum said. More than half of the estimated $145,000 cost of the project has been raised. An energy efficiency upgrade is in the works at the home, and the solar should be installed by 2020, Tinjum said. In December he’ll travel there with some University of Wisconsin students to work with consultants on the project. “Our goal is to install a high-quality project and have that serve as a blueprint for other projects on the island,” he said. One of the benefits of bike touring, Tinjum noted, is that you observe your surroundings more closely than you would zipping through in a car. Among other things, he was visually struck by the difference in solar proliferation between states. Community solar gardens were even more prominent in Minnesota than he expected. He blogged about them as a model for Wisconsin, Puerto Rico and elsewhere. Tinjum noted that on the solar front, Wisconsin leaves a lot to be desired. “Even though I’m from Wisconsin, I see Wisconsin as playing catchup in the role of advancing solar,” said Tinjum, noting that his department teaches a course for solar installers, engineers and designers. He was also struck by seeing contiguous 1-MW community solar gardens in Minnesota that each had their own interconnection to the grid, an arguably inefficient model necessitated by a limit on the size of community solar installations. “That showed we just need sound policy and legislation that makes sense to give customers this choice they want and make it work,” Tinjum said. As an engineer, Tinjum delved into the technical specifics of sites he visited on his trip. He was especially impressed by the Grand Ridge Energy Center, including about 210 MW of wind, 20 MW of solar and over 30 MW of battery storage, used largely for grid regulation. “I see that hybrid site as something possibly we will see more and more of,” he said. He noted that the Wisconsin utility WPPI was a sponsor of his trip, and that he expects to see utilities and other players invest more in solar in the Midwest and Wisconsin in coming years, just as wind has grown exponentially since he started working in wind energy a decade ago. “I think we’re in the ground floor of seeing where solar can go,” he said. Along with being an enthusiastic proponent of renewable energy, Tinjum is not surprisingly a big advocate of biking. This trip he used an electric-assist bike that allowed him to cover an average 100 miles a day. “E-bikes are particularly good for those who might have a longer commute – 12, 20, 25 miles, and the other thing I see is for families who have different biking capabilities, to match their paces,” he said. He made the trip with an e-bike on loan from Trek, which he said provided about one-third of the total power he used. On his blog he also touted the potential for electric cars, and posted a photo of his bike with a friend’s Chevy Volt. In an ideal world, an electric bike’s battery could be charged with solar power, he notes, and during his trip he did get to charge it at the home of a former student who has a solar energy purchase plan. Tinjum’s professional projects include work on developing stabilization for ground-mounted solar sites – including posts driven deep in the ground – that can survive well in Midwestern deep-freeze winters. The oversight agency affirms that consumers can turn to it to claim their rights and orders the Texas corporation to establish a protocol to disclose complete information about its services. It also allows customers to object invoices. Meanwhile, Puerto Rican company Maximo Solar Industries sues and accuses the Texas company of establishing a monopoly.